Did you know Facebook has two inboxes? If you can’t find a message someone claims to have sent to you on Facebook, it might be lurking in your hidden inbox. Making sure your Facebook profile stays private is relatively straightforward, but there’s no way to stop other people from sending you messages using the service. That’s no bad thing for most people — social media is about keeping in touch, after all — but the way Facebook is organised may mean you’re not seeing every message you receive. The problem stems from the fact that Facebook has two inboxes for messages — one for people within your immediate social circle and the other from friends of friends and spam. If you get a message from someone Facebook thinks you might know (such as a friend of a friend) you'll get a Message Request sent to your regular inbox, which you can choose to Ignore or Hide. However you won’t get a Message Request for all messages sent to you. Facebook filters out those it thinks might be spam, so you still might be missing some messages, which are sent to a ‘hidden’ inbox. Here’s how to find filtered messages in the hidden inbox using Facebook on your computer. 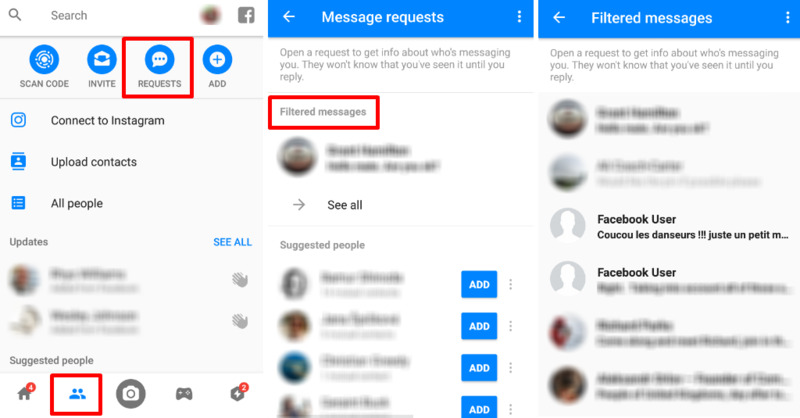 Scroll to Step 4 to find the inbox in the Facebook Messenger app on a smartphone. You can also follow the steps by watchng the video above. Open your Facebook home page in your browser so that you can see the newsfeed and then click Messager in the list on the left of the page, just below your name and profile image. This opens your main Facebook Messenger inbox, but if you look at the top-left of the page, you’ll see a cog icon. Select it, followed by Message requests, and then See filtered requests. Any that have been filtered will be listed below. Alternatively, you can just open www.facebook.com/messages/filtered. If you want to put the message in your main inbox area, click it to view it and click Accept below the text. Step 3: Click Message Requests. You can open any requests to see who is messaging you and choose to either Delete or Reply.